Ligting System mounts to your truck�s receiver hitch and features two 55 watt high-output lamps (130,000 candle power of light) in a high impact black plastic case. The lamps are angled to throw an 80-foot spread of white light whenever the vehicle is in reverse. So whether your camping and in need of a quick light source, or just trying not to back into your neighbor's pickett fence, the White Night Light System will be an asset to you and your truck. This unit is designed for vehicles without a under the bumper receiver type trailer hitch. 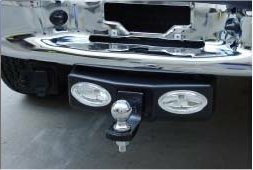 This unit mounts to the under side of the vehicles step bumper by either bolting or by attaching with a trailer ball. This unit is designed to be used with the smaller 1 1/4" insert receiver type trailer hitches under the bumper. The insert of the unit slips into the hitch receiver and is secured with a hitch pin. This unit is designed to be used with the typical 2" receiver type trailer hitches under the bumper.The insert of the unit slips into the hitch receiver and is secured with a hitch pin. This unit is designed to be used with the typical 2" receiver type trailer hitches under the bumper. This unit bolts to the hitch receiver tube and is open in the center of the unit to allow the use of the hitch receiver for towing. This unit requires 3/4" clearance between the top of the hitch receiver tube and the bottom of the bumper. This unit allows you to take advantage of the exceptional lighting while towing. Trailer wiring plug relocation plates for "Factory" installed hitches. Trailer wiring plug relocation plates for "Factory" installed hitches when using the "fixed mount" White Night units. Only required for FIXED MOUNT UNITS on factory hitch. For use when using a #0004199 Fixed Mount light unit on 1999-2002 GM pickups, 1999-2001 Tahoes/Yukons, 1999-2001 Suburban/Yukon XL with a factory hitch. This relocation plate is required to move the factory trailer wiring plug over 4" to the left to clear the light unit and allow easy access to the plug.